Our innovative Ph.D. program brings together departments from across NC State University to train a new generation of interdisciplinary data scientists skilled in developing novel understanding of spatial phenomena and in applying new knowledge to grand challenges. Please note that the application period for Fall 2019 is now closed; there are no Spring admissions. The application period for Fall 2020 will open in September. 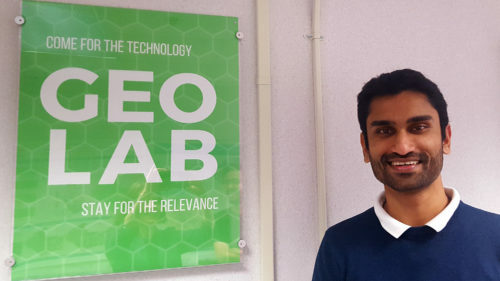 Vishnu Mahesh Vivek Nanda splits his time between NC State and the Wake County Innovation Center / GeoLab as part of an innovative partnership with Wake County. 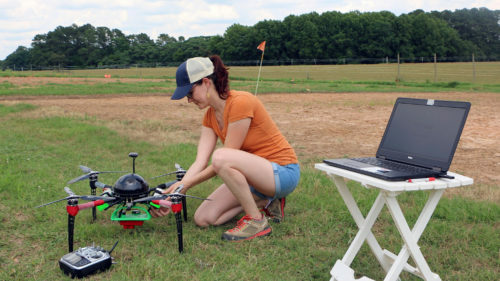 Kellyn Montgomery won a NASA/NC Space Grant fellowship to jumpstart her doctoral work and launch an innovative study of crop health using unmanned aerial systems. 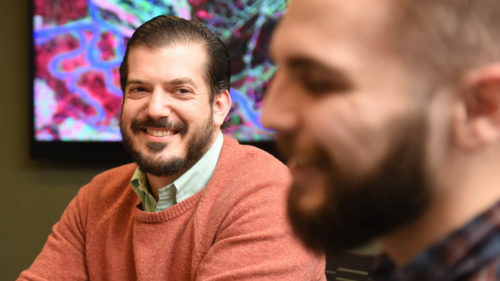 Jason Matney has had a big impact as a teaching assistant and course instructor during his years as a doctoral student; he is also the NC State 2019 EDC Student of the Year. Twelve fully funded Ph.D. graduate assistantships with $25,000 salary, benefits, and tuition support are available for Fall 2019 through the Center for Geospatial Analytics. Students are encouraged to suggest prospective advisor(s) and describe shared research interests in their application’s personal statement. The application period for Fall 2019 is now closed. The application period for Fall 2020 will open in September. Official NC State Graduate School application. Unofficial transcripts from all colleges/universities attended (official transcripts will be required if admitted to the program). 3 letters of recommendation. Submit the names and contact information for your recommenders through the online application, and they will receive an email with instructions for submitting their letters online. If you have questions about the application process, please contact Rachel Kasten, Graduate Services Coordinator (rachelkasten@ncsu.edu, 919-515-2800). 72 credit hours beyond the Bachelor’s degree. The core required courses comprise 18 credit hours. The remaining 54 credit hours are devoted to an individually tailored selection of electives and research. an off-campus professional experience. By the beginning of their third year in the program, students participate in an experiential learning activity within government (local, state, federal), industry, private and academic research institutions, or other organizations in the geospatial arena. Students consult with their advisors to identify specific opportunities that will enhance their doctoral program. a comprehensive exam. The written exam is required by the end of the 4th semester, followed by an oral exam consisting of the dissertation proposal defense, typically before the start of the 5th semester. a written dissertation and final dissertation oral defense required to complete the degree. Students examine why sustainable solutions to grand societal challenges need geospatial analytics. Emphasis is placed on the roles that location, spatial interaction and multi-scale processes play in scientific discovery and communication. Discussion of seminal and leading-edge approaches to problem-solving is motivated by grand challenges such as controlling the spread of emerging infectious disease, providing access to clean water and creating smart and connected cities. Students also engage in several written and oral presentation activities focused on data science communication skills and professionalization. Applied experience in the architecture of geospatial data management including open source options. The course introduces students to: (i) spatial and temporal data types (OGC specification, GPS and accelerometer matching), (ii) spatial predicates, (iii) spatial indices, and (iv) spatial query processing. In addition, students will be exposed to modern spatial data management systems like NoSQL and graph databases, and data integration principles including protected health information (PHI/HIPAA). Advanced understanding of physical principles of remote sensing, image processing, and applications from earth observations. Awareness of tradeoffs between earth observing sensors, platforms and analysis techniques will help prepare the students to critically assess remote sensing products and devise solutions to environmental problems. Students will be able to communicate the complexities of image analysis and will be better prepared to integrate earth observations into their areas of expertise. Topics include electromagnetic energy and radiative transfer; US and international orbital and suborbital data acquisition platforms; passive and active imaging and scanning sensors; spatial, spectral, radiometric, and temporal resolutions; geometric corrections and radiometric calibrations; preprocessing of digital remotely sensed data; advanced image analysis including enhancement, enhancement, classification, geophysical variable retrieval, error and sensitivity analysis; data fusion; data assimilation; and integration of remotely sensed data with other data types in a geospatial modeling context. Spatial data mining is the process of discovering interesting and previously unknown, but potentially useful patterns from the spatial and spatiotemporal data. However, explosive growth in the spatial and spatiotemporal data (~70% of all digital data), and the emergence of geosocial media and location sensing technologies has transformed the field in recent years. This course reviews the current state of the art in spatial, temporal, and spatiotemporal data mining and looks at real-world applications ranging from geosocial networks to climate change impacts. Course introduces various spatial and temporal pattern families and teaches how to incorporate spatial relationships and constraints into data mining approaches like clustering, classification, anomalies, and colocations. Methods, algorithms, and tools for geospatial modeling and predicting spatio-temporal dimensions of environmental systems. The course covers the physical, biological, and social processes that drive dynamics of landscape change. Deterministic, stochastic, and multi-agent simulations are explained, with emphasis on coupling empirical and process based models, techniques for model calibration and validation, and sensitivity analysis. Applications to real-world problems are explored, such as modeling multi-scale flow and mass transport, spread of wildfire, biological invasions, and urbanization. 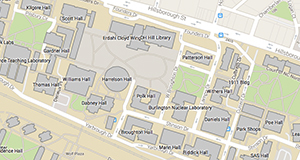 Principles of visualization design and scripting for geospatial visualization. This course provides a systematic framework of visualization design principles based on the human visual system and explores open-source geospatial data visualization tools. Topics include challenges and techniques for visualizing large multivariate dataset, spatio-temporal data, and landscape changes over time. Students have the opportunity to work with broad range of visualization technologies, including frontiers in immersive visualization, tangible interaction with geospatial data and eye tracking. Below are some of the most frequently asked questions we have received about the Ph.D. program in Geospatial Analytics. If your questions are still not answered here, please feel free to contact us through the form below. Can the program be completed online or part-time? No, the Ph.D. in Geospatial Analytics is a traditional full-time on-campus program. I am currently in a master's degree program and will complete my degree in the spring. Can I still apply now to start the Ph.D. program in the fall? Yes. We accept unofficial transcripts with your application. Official transcripts will be requested if you are admitted to the program. Do I need to have been a geography major to apply? No, we welcome applications from students with strong computational skills from diverse backgrounds, including computer science, data science, environmental science, ecology, engineering, and more. Do I need a master’s degree to enroll in the Ph.D. program? No, students may enroll without a master’s degree. Successful applicants, however, will have had previous research experience. The National Organization of Gay and Lesbian Scientists and Technical Professionals awards scholarships for LGBTQ+ students pursuing degrees in STEM fields. The League of United Latin American Citizens (LULAC) offers scholarships for Latino students. Do I need to secure an advisor before applying? It is highly recommended that you connect with a potential advisor before you begin your application. The application will ask you to name a preferred advisor, and you will want to make sure the person you indicate is taking on new students. What kinds of projects might I work on? 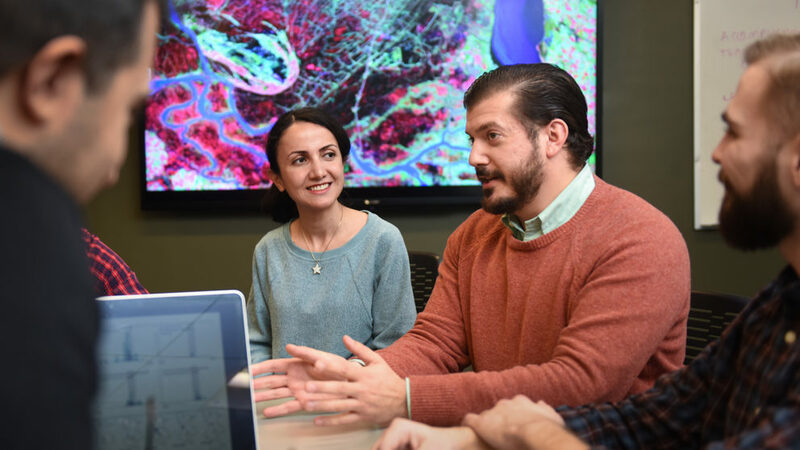 Students in the Geospatial Analytics doctoral program work on a diverse range of data science frontiers intersecting multiple disciplines, with funding available from the Ph.D. program as well as from external grants secured by faculty. Assistantships are each fully funded for four years. Below are a sample of the opportunities that were available for Fall 2019. For more details about each opportunity, and to learn about past projects, visit our Graduate Assistantships page. We’re here to help! Contact us for more information about the Ph.D. in Geospatial Analytics. Our graduate assistantships are fully funded with a yearly stipend, tuition support, and benefits. Learn more about opportunities at NC State and the Research Triangle to enrich your graduate experience.